Caring for your new Gold Coast Landscape Garden. If you have just spent tens of thousands of dollars on your new landscape garden, then you will probably be looking at ways to protect that investment. Ongoing gardening maintenance for your new garden will help to protect and enhance your property value. In the past it was normal to have irrigation systems with pop up sprinklers giving everything a thorough soaking. Often, we would see lots of water running down driveways and streets resulting in a huge waste of water. Water is much too precious and expensive resource to do that with these days. Roll out lawn on a Gold Coast Nature Strip, just starting to get established. Gold Coast city council guidelines now severely limit the use of fixed sprinklers, and also limit the rate at which drippers can emit water. Pop-up sprinklers are also very prone to damage, so a lawn mower or vehicle can easily cause a lot of expensive damage to a pop up sprinkler system. Also, the irrigation systems are designed and installed to not only save water but also bias the flow towards plants that need watering the most. As a result of this, your new landscape garden is vulnerable to drought and dry weather until the root systems can get fully established. To lessen the effects of dry weather, landscape gardeners will favour the use of higher quality top soils with a good amount of organic matter. Different top soils are used for lawns as a hard-wearing lawns needs to have a very free draining topsoil. This can have an effect on water conservation however. To make best use of the water available, soil wetting agents and fertilizers are spread over the finished gardens and lawns. Top quality mulch with a slow breakdown is used as much as possible. Despite all of this, new landscape gardens, and in particular lawns, require extra care or gardening maintenance in the early stages of getting established. Gardening Maintenance -Spreading of soil wetter and appropriate fertilisers will keep your landscape garden looking great and save water. To best protect your new landscape garden, it is recommended that a maintenance gardener regularly checks on the garden and gives the lawn a good water. Lawn Care for your new Gold Coast lawn. New roll out lawn has very short roots. To give the roots good contact with the topsoil, new lawns are given a light roll and top-dress when laid. As the roots as minuscule, for the first two weeks the lawn should be hand watered for at least an hour per day. Watering first thing in the morning is best, as less water is lost to evaporation from the hot sun. Evening watering is also good, but there is a slightly higher risk of fungal diseases if the lawn is damp all night. Always check if there are local watering restrictions in place. As the lawn root system becomes established the watering frequency can be reduced to twice per week. Check the grass joins for any signs of distress. If the grass is starting to brown around the joins and the joins are not closing up, then more watering is required. Spraying on a liquid fertiliser and plant tonic like Neutrog Seamungus Liquid can be a great help to stimulate root growth of your new lawn. If the new lawn does dry out, use a spray on soil wetter to prevent the water just running off the lawn. Depending on the weather and garden maintenance, there should be enough root growth for the irrigation system to maintain the lawn after about 9-11 weeks. These measures will also make your new lawn more drought tolerant. Gardening Maintenance Caring for your new Gold Coast Garden. An essential part of gardening maintenance is lawn weed control. As part of the ongoing lawn maintenance, it is important to remove any lawn weeds before they can get established in your lawn. Some aggressive grass weeds will spread rapidly and ruin your new lawn before you know it. This is where having a maintenance gardener who is an expert in plant identification is of great benefit. Lawn weeds need to be identified and appropriately and thoroughly eliminated from the new lawn. The best protection from weeds is a healthy sward of lawn growing vigorously. Garden Maintenance keeping this beautiful lawn in great condition protects your property value. To keep your lawn looking great, the lawn should be aerated, and top dressed every Autumn. The organic matter in high quality top soil can settle or break down a little over the first 12 months, so the lawn should be checked over for any unevenness or sinking relative to paths and lawn edging. Early Autumn is also ideal for checking on the effectiveness of the irrigation system as dryer areas of lawn will be easier to spot. 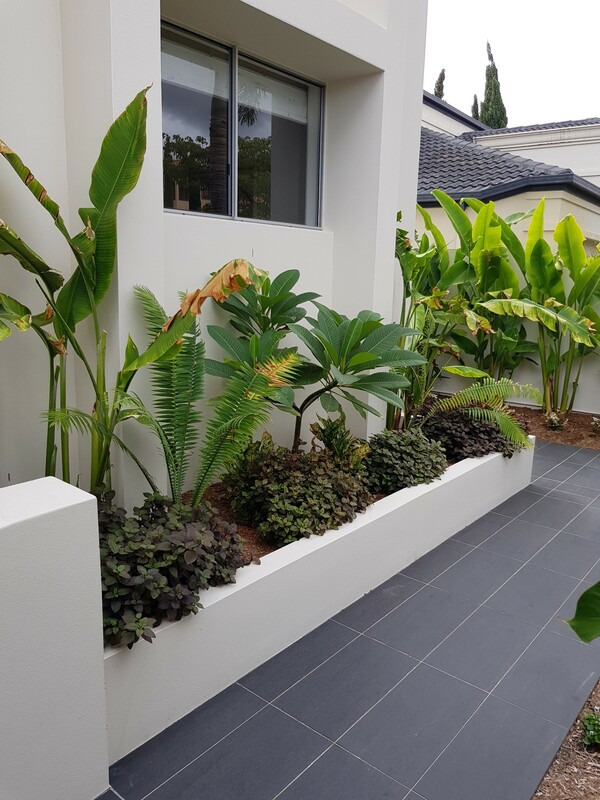 Ongoing Gardening Maintenance Gold Coast. As with the new lawns, it is also important that the garden beds are checked for any weeds trying to take over. Again, a qualified horticulturist who is an expert at weed identification is best placed to protect your landscape garden investment. Mulch should also be replaced as it rots down, and the condition of garden edging and irrigation systems should be checked. In the first few weeks of planting a new garden, the garden should be watered by hand twice per week. Use of a plant tonic like Neutrog Seamungus will also help to get your plants established. A garden hedge that is not regularly trimmed will soon get out of hand. To look their best, the hedge needs to be regularly shaped. If the hedge grows too tall, it becomes difficult to maintain. Hedges that have gone out of shape often need to be cut back hard, which gives them a bare appearance. A hedge that is not properly maintained may have to be cut back hard. This can leave a bare appearance. Neatly Trimmed Hedge with terracotta pots. Contact us to find out how to make Red’s Landscape Gardening your property management partner. For Gardening Services or help with the design and development or your landscaping ideas, contact one of our experienced Landscape Gardeners. We can help with small garden design all the way up to Commercial Landscape design. Our specialities include fast growing screening plants, plant health and horticulture, garden lighting and outdoor pool landscaping ideas. For some landscape garden design ideas, take a look at our Garden Design blog.